Drifter Jack’s Hostel has a 24 hour cancellation policy. If you do not cancel your booking before 5pm the previous day, it will result in a cancellation charge equal to the first night of your stay and the remainder of the reservation will be cancelled. **If you book a stay during SXSW (March 8 - 18, 2018) please review the cancellation policy. The 24 hour cancellation policy does not apply to the SXSW dates. Check in begins at 3 pm. If you arrive to Austin earlier, we can happily host your luggage in our storage area while you set out to explore the town. Check out is at 11 am. All guests and their belongings must vacate their room before 11 am so our staff can adequately prepare rooms for our next set of travelers.If you are departing Austin later in the day, we can happily host your luggage in our common room or office while you make your last rounds on the town. Quiet hours are between 10 pm and 8 am. We want you to have fun and can provide you with a list of options for late night shenanigans outside of the hostel. Please be respectful of other guests’ experiences at Drifter Jack's. Payment policy: The full cost of the reservation is due at check in, along with a valid driver’s license or passport. Cash is accepted. We do not accept American Express. The hostel reserves the right to refuse any patron at any time for any reason. Website prices do not reflect local lodging tax. Damage or Loss to Drifter Jack's Property Guests are responsible for damage or loss they cause to the property. To avoid charges, please return your key to the front desk to retrieve your $10 deposit. All damaged property will be assessed and charged to parties responsible. Parking in our lot is available for Drifter Jack's guests on a first-come,first-served basis. Please call prior to approval to confirm availability. We encourage biking, walking and public transit for getting around. We also rent bikes for daily use. Public street parking is also available nearby. Please be mindful of limited hours and metered fees. Housekeeping Sheets, pillow and blanket are provided on a pre-made bed. It is up to guests to make their bed each day, should they desire, and stays of longer than 4 nights will have their sheets and towels refreshed on the fifth day. Any guest may trade their towel in for fresh ones anytime. Daily housekeeping of rooms, bathrooms and public space is provided. 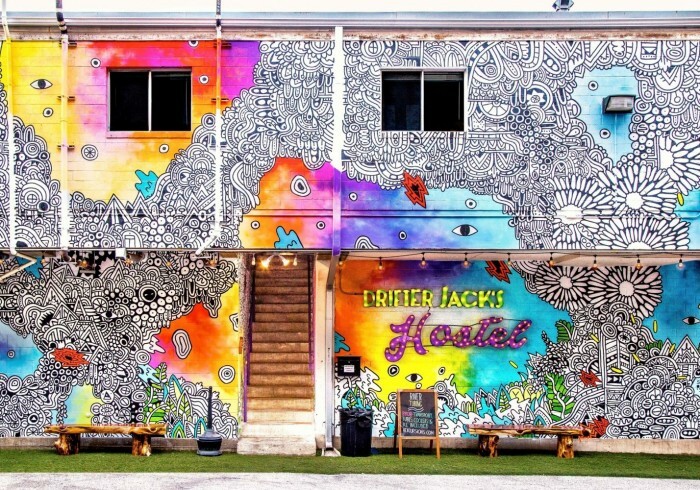 Drifter Jack's Hostel is a community of like-minded travelers. Follow all posted hostel rules. You will sign an agreement upon arrival and will then be liable for your own actions during your stay. No eating in guest rooms. Please use our kitchen, common room or outside patio to enjoy your munchies. Out of respect for your bunk mates, and to minimize pests, please do not eat in your room. Welcome to your home away from home in Austin, Texas! Our comfy hostel is located downtown across from the University of Texas near famous 6th street, Hope Outdoor Graffiti Gallery and minutes away from all of Austin’s main attractions. While most of the city center can feel deserted in the daytime, our colorful neighborhood is always buzzing with life. West Campus is filled with independent shops, quirky cafes, vintage clothing stores and artisan vendors. Perfect for experiencing the real Austin! Drifter Jack’s is passionate about hosteling. We know that hostels have the potential to create lifelong friendships and unforgettable memories. Our favorite hostels around the world made it fun and easy to connect with other travelers while experiencing the city like a local. That is exactly what we strive to do. For example, join us for our pubcrawl every Thursday and Saturday where we show you the best spots in Austin! At DJ’s our focus is on community, comfort and cleanliness. In order to truly represent our creative city, we invited over 25 local artists to paint murals throughout every room and common area. If you’re looking for an intimate home base with a great vibe and central location, you’ve come to the right place. Let our friendly staff show you why Austin is known for its retro charm and southern hospitality! **All SXSW bookings must be made directly through the hostel website at www.drifterjackshostel.com.